Joan is interrogated by FBI Special Agent Malick. Malick has a recording of a call from Michael to Bazemore with the sound of gunshots and him yelling "Joan." 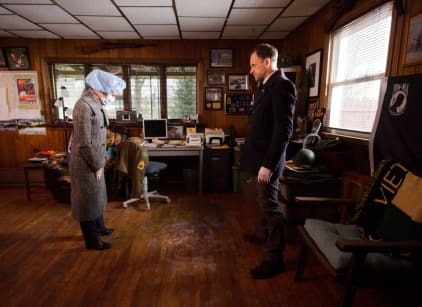 Sherlock and Joan resolve to solve Michael's murder. At his home, Captain Gregson tells Sherlock he can't hand over evidence about the case to him. Sherlock breaks into the morgue and steals the autopsy report and takes a photo of Michael's corpse. Sherlock finds Denny Mulgrew, the medic who stitched up Michael. Denny's house is the murder scene. Sherlock determines the murderer is a woman, but she has the same size shoes as Joan. Sherlock thinks maybe Malick killed Michael. Sherlock had Denny burn down his home to destroy evidence. Marcus resists at his questioning by the FBI. Marcus turns over information on the investigation to Sherlock. Michael's body was found in trash from Harlem. They check the Harlem sanitation hub, only to find out that its surveillance footage had been erased by Captain Gregson. Gregson came home to find his home trashed by Sherlock, looking for a copy of the footage. Michael's killer is Hannah, Gregson's daughter. She had taken time off and launched her own investigation of Michael. She attacked and killed Michael at Denny's house. Gregson did all his coverup before Malick came after Joan. Joan wants to do nothing and take her chances because she doesn't want Hannah to go to prison. Sherlock meets with Hannah, to get all the details. The FBI agents bring in Joan. Sherlock confessed to the murder, producing the murder weapon, then went home to England. He claimed to be acting in service of the Crown. Sherlock is actually at their mansion to say goodbye and to thank her for saving his life. Joan moves to London with Sherlock, and they're working with Scotland Yard.